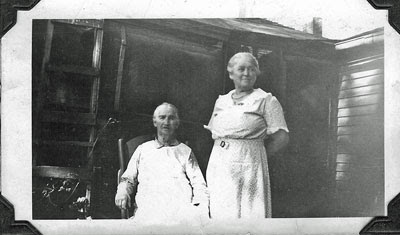 My great, great grandmother Amanda Knotts was a strong woman. She was born in the Shenadoah Valley of Virginia. I don't know what led her to marry my great, great grandfather George Knox, 20 years her senior. It was 1870, so I imagine it was out of practicality. As one might think, she outlived George by 25 years. She was the matriarch of the family and raised six children on a ranch in Idaho. Last year I posted a blurb I found about her on the Web from a History of Idaho published in 1920. 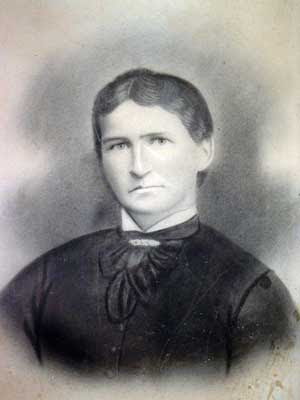 The author wrote that "Mrs. Knox has long lived in this district and has therefore witnessed much of its development and progress, her memory constituting a connecting link between the primitive past and the progressive present." When Amanda (pictured above left next to her daughter Elvie) died in 1936, she unfortunately had witnesses more of the progressive present than she had bargained for. By that time she'd watched my 18 year old grandmother run off and marry a farmhand who lacked the work ethic for anything but producing children. She also witnessed all of her ranch land sold off to make way for the progressive present. I personally would have liked to see some of the primitive past remain. But again, obviously I never knew my great, great grandmother. My mother barely knew her but remembers her sitting in her rocking chair on the porch smoking a corn cob pipe. She was kind to my mother, something that was a rarity in her family growing up. 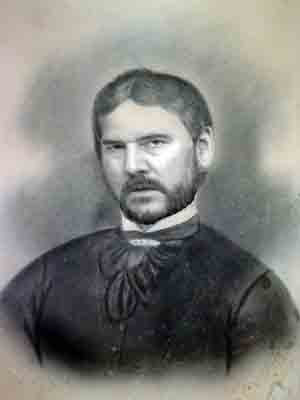 So I have a hunch that Granny Knox, although forged in a tough land, was a good and kind person. I hope I've inherited part of that side of the family. I do think I have her eyes (sorry Granny). Before I met my wife, I vowed that if I ever met a woman who smoked a corn-cob pipe I'd instantly fall in love with her. I can't count the times I thought a woman was attractive and then was turned off when she stunk up the place with a cigarette. You have inherited the "good and kind" gene and you look simply stunning in that dress. She sounds like a spirited with a lot of guts.....they built em tough in those days. I knew what you were trying to say. Thanks. I think Amanda Knox would have been an interesting person to know. Huh. I guess that Bubble Pipe I've had since I was a kid came in handy after all. I can imagine going back in time and just standing by in amazement at what those have passed endured. Listening to the conversations watching their struggles yet knowing you can't interfere. I reckon you got ya Gran's beard! K. R. is simply a contrarian. You should be used to it by now. If my granny smoked a corn cob pipe it stands to reason she could grow a fairly decent beard. You can't stand in the way of DNA.